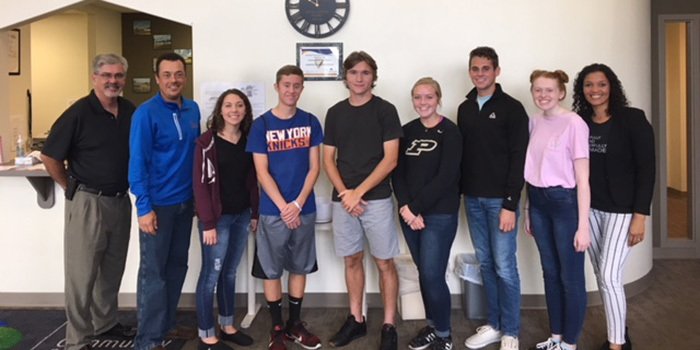 Pictured, from left, are Tony Cirello, KYLA moderator; Eric Lane, director of Fellowship Missions; Alyssa Bell, TVHS; Gavin Greer, Triton; Wade Allen, WCHS; Kelsey Nethercutt, WCHS; Colin Rhoades, Wawasee; Madison Dyck, Whitko; and Alyssa Lowe, CCS director of development. KOSCIUSKO — Kosciusko Youth Leadership Academy recently welcomed students to learn more about social services offered throughout the county during an event held at Combined Community Services, Warsaw. Stephen Possell, executive director of Combined Community Services, welcomed students and provided an introduction on CCS’s mission and the many programs the organization provides that give back to the community. Possell also provided information on his own personal background and journey to his position. Following his introduction, students were split into groups and worked together to complete a community service project for CCS. Projects included the sorting of donated clothing, organization of the food pantry, cleaning of meeting spaces for clients, data entry and putting diapers together into packs for families. The project was proceeded by a presentation from Eric Lane, director of Fellowship Missions, a local shelter which provides housing and support to men, women and children in need. Lane explained the shelter offers two major programs: one for emergency services and needs and a second for those needing a two-week stay including basic provisions such as food, clothing and shelter. According to Lane, the two-week stay is followed by a program which assists in teaching of self-reliance. This program offers clients one-on-one meetings to help develop and focus on education, addiction issues (if needed), employment and their spiritual journey. All residents also learn basic life skills through chores at the shelter including cleaning and cooking. After Lane’s presentation, Alyssa Lowe, CCS director of development, took students through an exercise in which they were given a limited amount of funding and faced bills similar to those an adult would encumber. She then presented students with situations where their lives could change due to circumstances and had them reassess their budgets with less resources. The event helped demonstrate to students how to distribute funds within a limited budget. In addition to the activity, Lowe also provided students with information on the resources available through CCS, which also offers a two-tiered approach to service – emergency and self-sufficiency programs. Lowe discussed CCS events such as the sleep out to raise funds for their utility program and the prom program, which allows students in need to receive a dress, hair styling and makeup through donations. In addition to these services, Lowe noted CCS also provides legal assistance through community volunteers. For more information on KYLA or to learn how to get involved, visit the KYLA website at http://www.kosciuskoyouthleadership.org/ or on Facebook at @kosciuskoyouthleadership.